As I expected, my 2017 was busy, fun and productive at the same time. I’ll begin with some of my favorite fun facts of the year, follow with some of the failures and then the many positive accomplishments I am happy about. ‘Adjust your singlet’: I made a harsh comment about the “Passco Mobile” app, and the message below is what I got in response. My exact comment was about how frustrated I was the first time I tried their app, and I, fortunately, referred to the application as “Crap”, which if the app hasn’t improved since then, I’ll be happy to even comment it as a douchebag instead! There can be all sorts of crazy things on Twitter, and I met one of that. 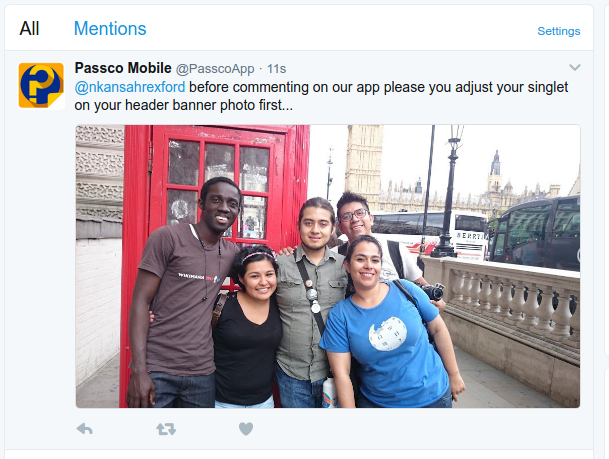 I guess my singlet covered Passco Mobile’s face so they couldn’t see the iconic Big Ben Clock in the background. ‘Johnny Walker‘: Of all dummy anonymous names to choose, he/she/it/they chose Johnny Walker. Johnny Walker was the fictional character (were/was it/she/he/they?) that came proving a high level of intellectuality on my article related to the GhanaPostGPS. Check out my articles for a screenshot of the messages from Johnny Walker. He/she/it/they deleted the messages after some time. What they/she/it/he didn’t know is, admin/moderators get a direct email of any comments made on their blog if they have the option enabled (I always have mine). 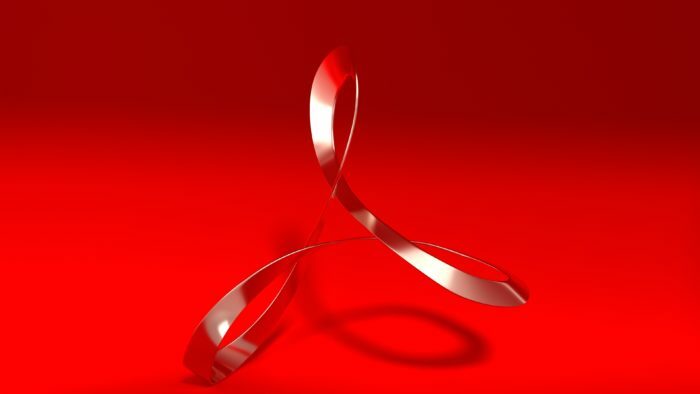 Read my Hubtel articles for the insights from Johnny Walker. One of the funny comment Johnny made was that, because Hubtel had a 96-man company with branches in other African countries, they *must* be doing the right thing, and I am wrong. Mudclo: I won’t say much about that gimmick so-called ‘Search Engine’ a sociology student claims to have built. To all those who praised it, I have one image for you. I wrote a piece on why I think Mudclo is Mad and a Clown. Where is that thing? Anyone hear about it? I even did a parody video about Mudclo, however with PackageToMe (which fortunately is a real product and still available to use). See the video of a 25-year-old Ghanaian who builds an Amazon Rival Platform. DaloRadios Revamp: One of my goals this year was to rebuild the Daloradius Freeradius management using Node and Angular. Failed. I lost momentum when I realized I didn’t fully understand the entire outworking of Freeradius and how authentication happened. I needed this understanding to be able to replicate a similar feature in Node. The available project, Node Radius, although very extensive, to get it to work in the likes of how Daloradius danced with Freeradius and MySQL, I needed more understanding than how to put them together. I just stopped when the motivation to continue dropped, and I found Unifi Controller instead. Read about my revamp goal. 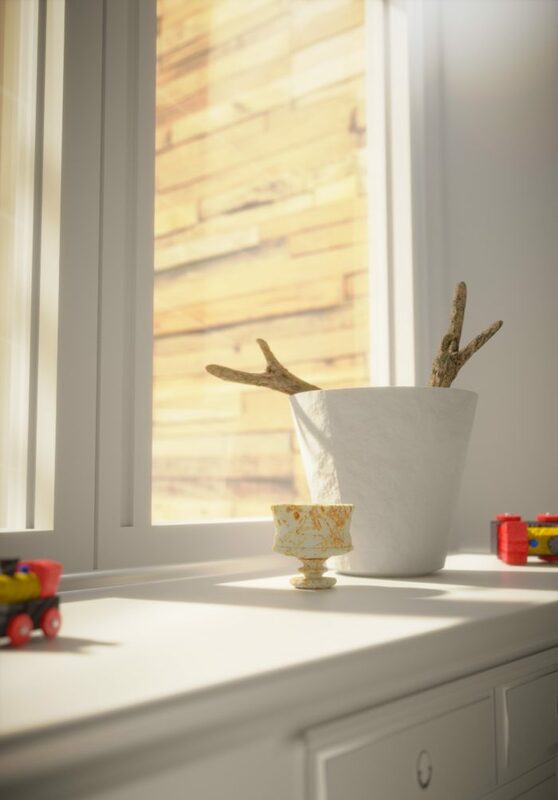 Blendering: Goal was to render a Photorealistic 3D Image each month of the year. Failed! Started the year, kinda well, but couldn’t maintain the vim. Tried a few renders, except the motivation to complete weren’t there. 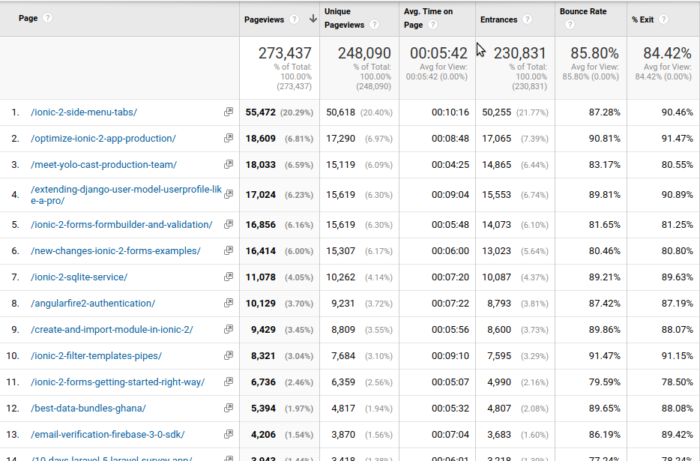 I share some of the metrics from blog.khophi.co in this section. It has been a busy year for my blog, and the numbers although not impressive, increased a bit. Here are pageviews over the 1 year period, from December 27, 2016 to December 26, 2017. 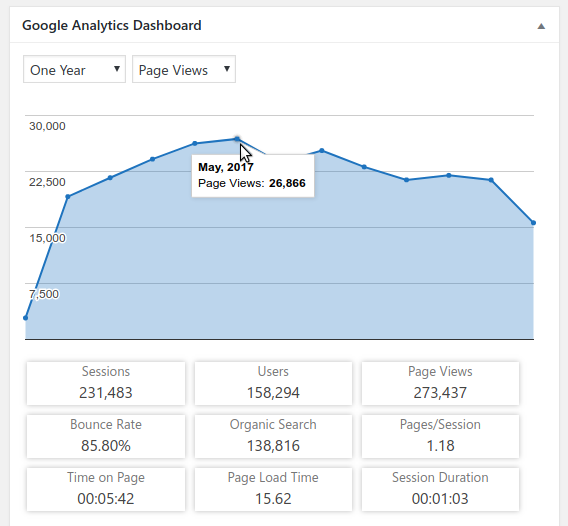 The highest peak was in May, 2017 at 26k+ page views. Chrome, unsurprisingly, took home close to 2/3rds of the entire usage pie. Critics still believe Chrome is the slowest of all browsers, so not the *best*, except their definition of *best* is flawed. Not gonna go down that rabbit hole argument for now, here. 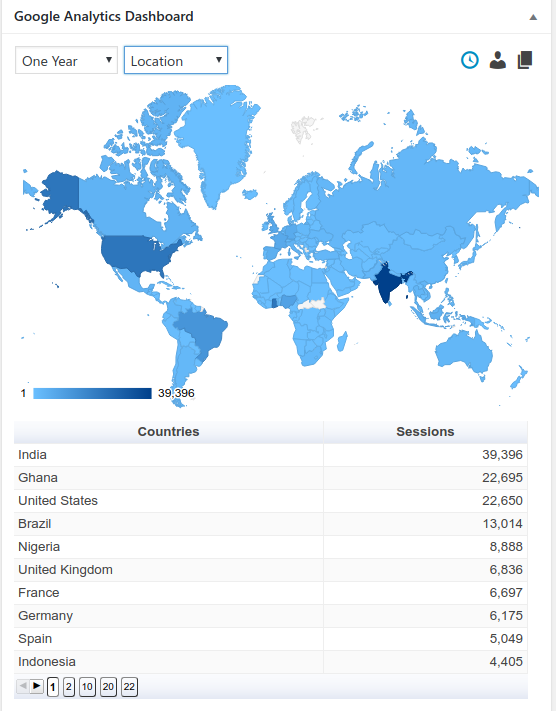 In terms of location, Indians made the highest visit sessions to blog.khophi.co in the past 1 year. My articles on Ionic brought in the highest traffic, a sign more and more are getting into and or are looking for solutions to Ionic problems. Then my article on How to Extend the Django User Model like a Pro comes in next. Linked from StackOverflow, that article has rippled a lot online. 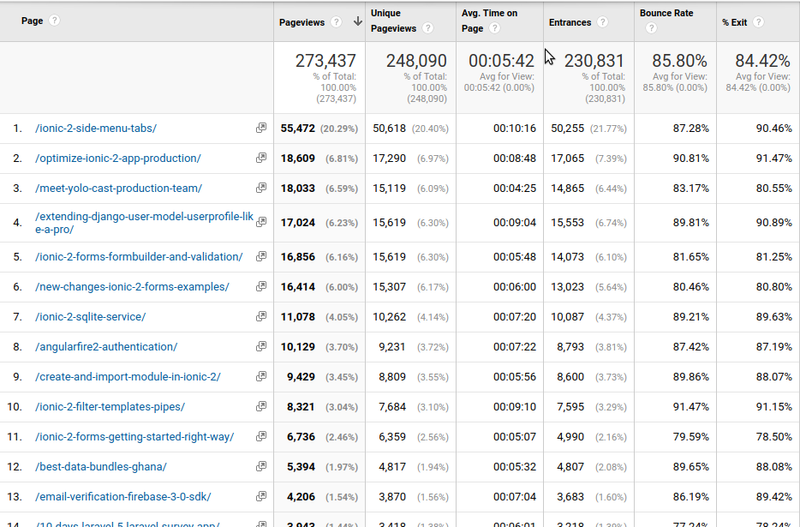 About AdSense revenue, unfortunately, there isn’t anything to be excited about, so will skip the stats of it. I wrote over 30 articles this year. For sure, there were posts about Angular and Django and Ionic and Angular. Yes, I took a deep dive with Progressive Web Apps this year, and the experience, although mixed, depending on framework used, I ended up sharing some of what I learned. At least, I learned the hard way, Ionic 3 is the worst framework out there for Progressive Web Apps. 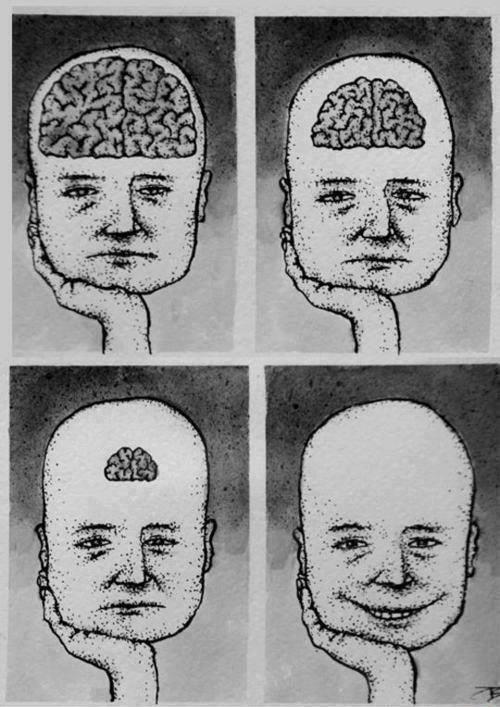 Just steer away from it. Here are some of my favorite articles of the year. Ghana post articles: I wrote a series of articles about the GhanaPostGPS web and mobile application. To me, the expense incurred outweighs what was delivered, thus, a waste of the taxpayers money. Paying 400k$ to Google Maps? Such a great avenue for Vokacom to have flexed their muscles in carrying home 2.5m$ for a meager job done. Hubtel #)$*)(#* on Me: Payments was a focus for me this year. Joined the Mobile Money wagon. Had a bad API experience with Hubtel. Shared a few of my thoughts how it could be improved (think of it as the work of a Developer Advocate). In short, Hubtel made sure I was the one hallucinating, and asking for a feature which is flawed and wouldn’t help anyone. Nonetheless, before I could drop my payment tools, Mazzuma hits me up, and a great solution it was, they present. Mazzuma redeems me, shame on Hubtel: Mazzuma’s API made it easier for the end developer. No callbacks. Nothing. Just make a request, and get a success or failed response. Check out my other recent articles. I came into 2017 to focus on only two applications – Fokosd (which is now called KhoPhi) and Daloradius Revamped. Guess what, I ended up building 6 personal projects instead, including the Fokosd. PackageToMe was built with Django and Bootstrap 4, with a Web Manifest for installation on mobile devices. MenPha Rebooted: The first MenPha application was built in 2012 with Django. It was redesigned and ‘rebooted’ for use in the Tech Leads Programming Class. Buy AlwaysOn: For our neighborhood WiFi internet project, we needed a way for users to purchase and generate their own access codes or vouchers. Buy AlwaysOn was built using Angular 5 on client as a Progressive Web Application using Express as API, MongoDB as database, and Mazzuma as our Mobile Money Payments Gateway provider. KhoPhi: KhoPhi makes it easier to share quick stories with little distractions, in less than 6 cards. 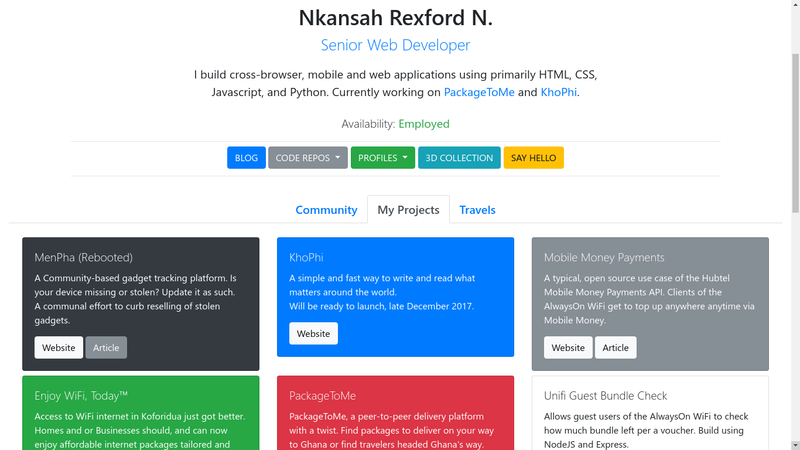 KhoPhi was built using Angular 5 with Angular Universal Server-Side Rendering enabled, served via Express with MongoDB as database. Redesign khophi.co: My personal website, khophi.co, had a redesign. Initially built with MaterializeCSS, it was switched to Bootstrap 4. Bootstrap 4 cards is simple and easy to use. Unifi Guest Check Bundle: One of the requested features by users of our neighborhood WiFi was a way for them to check their own bundle and how much they have left in there. Redesign Sibton Ghana: In union with TheAfricanDream LLC, I redesigned the Sibton Switch website with new hosting. It is a WordPress instance, running on Digital Ocean. A major project we have been working on seriously this year is the EnjoyWiFi Neighborhood WiFi internet. In fact, it is gradually turning into a company, as we work on the registration. The site is EnjoyWiFi.today, and you can learn more about it. However, in short, we provide internet access to communities and public places via WiFi. We’re planning a major expansion of the WiFi coverage early next year. We hope it’ll be what our loyal customers love, since they could access the WiFi at farther areas, with a mere receiver and tap into the WiFi experience. Young At Heart: Walking Junior High School students through basics of HTML5. IoT in Africa: A 3-week Internet of Things course at Koforidua Technology University, led by Sam Moorhouse. Happy to have been part, in getting up to speed with Internet of Things. Played with the Raspberry Pi 3 for the first time via this course. A great experience. Django Girls Accra and Koforidua: Coached for the first time at DjangoGirls Accra, and a subsequent similar event in Koforidua. We took more than 1,000 images under 24 hours, so you’ve got lots of images to go through. On CitiFM: CitiTrends Episode 28Got invited to join Ashon on , in discussing the GhanaPostGPS application. DevFest2017: Handled a presentation at the DevFest17Gh at NIIT in Accra, on the topic of Progressive Web Apps with Angular. A major part of applications I built this year were built with the progressive web apps principle in mind. 2017 has been a very busy year for me, if not the busiest. With more endeavors upcoming, I hope to keep learning, and building even more fun and useful and better applications. Joined a software company in East Legon, Accra, as a Senior Web Developer. Starting 2018 with even bigger web application projects on the table. Ooh it’ll be fun! Will still keep at sharing interesting and fun tech tips I come across in helping us all build easier and simpler web applications using the web tools we love and use. See you next year, 2018. Previous Post Google’s Project Loon Test Flight in Ghana?